Superciężki czołg konstrukcji niemieckiej. Największy tego typu pojazd jaki zdołano wyprodukować. Jeden z najbardziej opancerzonych czołgów III Rzeszy. Ze względu na swoją konstrukcję czołg można było nazywać „ruchomym bunkrem”. i have bought the WoT Maus. Where can i find the bonus code in the box? The code is on the back of the instruction manual. this was my first Cobi-tank that I bought and it's a massive tank. The tank itself is nicely designed and feels right. I was always a fan of this tank so again thank you. Is there any plan for the Karlgerät? 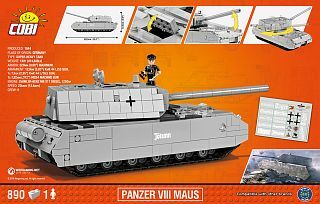 If you have made a maus will you be making the ratte as well? This set is amazing. I love the maus and this set fills in all of my expectations. But I also have some questions about futuristic upcoming sets. 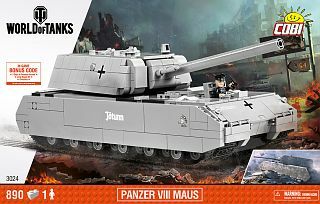 Is Cobi going to release more tank destroyers such as the jaghtiger and the isu-152? And is there a chance Cobi is going to make an is-4 or is-7, they would be great competition to play against the maus. Pls reply and keep up the good work, Cobi is making beautiful sets. We do not exclude, however, that in the future we'll make sets you mentioned. Please keep up to date with our offer. Thank you for your interest and ideas. I bought it online. 900 pieces took me few hours. Built it without a break. Its a very beautiful set. No problems and a really playable toy. This is by far the best set. Its hughe. I am not sure but the turret could be slightly wider on both sides. Maybe I will try to customize it. And then maybe I will buy Opel Blitz next. That will surely look great alongside this Porsche Maus. Thank you for your opinion on this set, we're really glad you like it! We hope you'll like other models, too - please keep up to date with our offer. Is there a shop/dealaer/reseller in Berlin where I can buy and/or order cobi toys? I contacted cobi via email but got no reply. I recently order from ms-plueth.de. Maus should be available on Amazon very soon. Please keep up to date! i cant wait for this beautiful tank to be in collection. is it available right now? 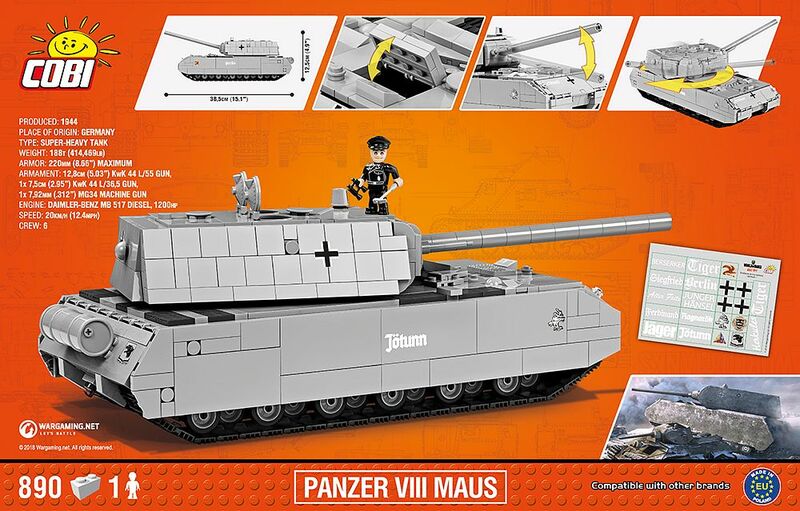 Maus is already available - you can buy it eg. directly from our website. Depending which country you are from, you can already check in shops. I want to buy that but I don't know where can I buy that and when it is available. Please answer my question. Maus will be released around half May so please keep up to date! The price for Maus is ca. 50€. I can't explain how excited i am for the maus and the strv 103! So excited for the MAUS!!! When is this ready fo purchase??? Maus is planned to be released in May. Please keep up to date with our offer. All information has already been sent to your e-mail address. Please be assured that we answer all messages we receive in a few days.